You don't have to be famous to create an experience on Mightybell in which you break down a goal into actionable steps and have people follow/learn from you. 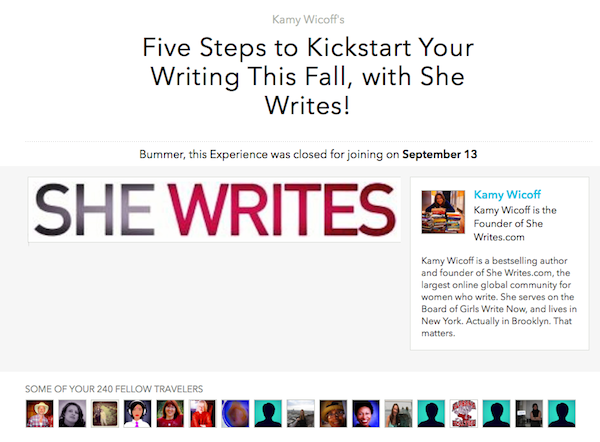 But the young startup, founded by Ning co-founder Gina Bianchini and launched in September, has sought out relationships with magazines like Cooking Light, social celebs like Soleil Moon Frye and experts like author/coach Gabby Bernstein to create some pretty compelling (and evergreen) experiences that appeal to a broad audience. Gina tells LAUNCH that these folks now "see the potential of Mightybell to engage their friends, fans, and followers to master a topic or achieve a goal." 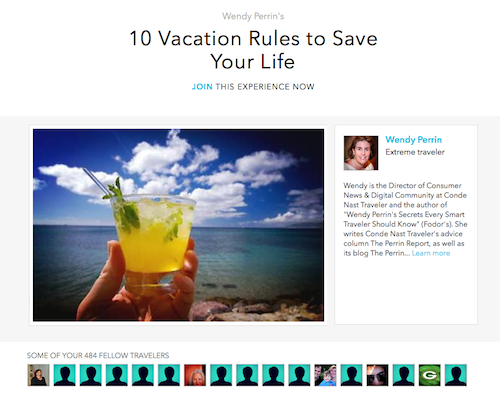 At the top of the just-launched "Discover" section -- which Gina says was long planned -- you'll see "10 Vacation Rules to Save Your Life" from Conde Nast Traveler columnist and digital community director Wendy Perrin (484 followers or "travelers" in Mightybell-speak). On the same page, in the food category, you'll see an experience from Cooking Light contributing editor Lia Huber (32 followers); an "art and design" experience from HelloGiggles, an entertainment site for smart women co-founded by actress Zooey Deschanel (428); and a "success" experience from Kamy Wicoff, founder of SheWrites.com, a community of women writers (240) [ screen shots below ]. Gina says they chose to feature these experiences because of their popularity and because they were "ones we qualitatively like." When Mightybell launched, we asked Gina about trying to get celebrities to use the service. She told us then, "I believe the best social software services are compelling to people to have a small handful of friends to a large following and I hope we eventually see both on Mightybell." Cooking Light appears to be one of the few brand names that wants Mightybell users to pay ($5) for their experience of "4 Steps to Doubling the Veggies You Eat." With 32 people signed up, that means $120 for Cooking Light and $40 for Mightybell, which gets 25% of each premium experience. Gina won't say how many experiences are on the site or what they've learned about pricing premium experiences, but by our quick count, "success" is the most popular category with 13 experiences (self-help never goes out of style) while the others have five or six. Clearly, paid experiences have fewer followers than free ones. Mightybell made it possible for creators to add YouTube videos to their experiences earlier this month.